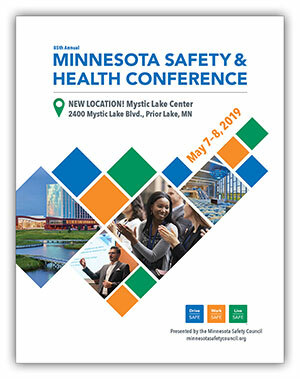 Our annual Minnesota Safety & Health Conference — the Midwest's oldest and one of the largest gatherings of workplace safety and health professionals in the country — has a new look! We think a new look in a new place will make the conference even better for you! We heard that three days is too long, so this year’s conference is two days. We heard you’d like better food choices, so this year we’ve got new options. We heard you’d like training ahead of time, so we’ve added additional professional development classes on Monday (May 6) before the conference. And, we heard you’d like more networking opportunities, so we’ve added a reception to Tuesday's lineup. If you are new to the conference, you will find training and networking and inspiration. If you are a returning attendee, you will find the same great conference features in a better package. We look forward to seeing you at the conference and thank you for helping make 2019 safer! Group Discount: Register 5 or more from the same company and receive a 15% group discount.